When I was a little girl, my mom would bring a simple white handkerchief to church and would fold it into a baby cradle in order to keep me entertained. I loved it and would request it often. As a child, it seemed like magic. 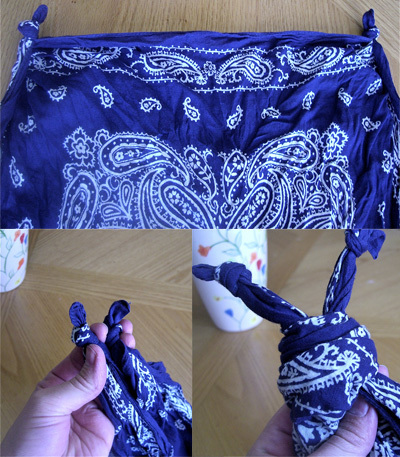 Recently, I started carrying a bandana in my church bag and have been experimenting with some different ways to fold it. Jellybean likes these handkerchief tricks as much as I did all those years ago. It's a fantastic quiet activity for church or the doctor's office. Here are two folding ideas that we've been enjoying. Start with a flat bandana and knot the top two corners. 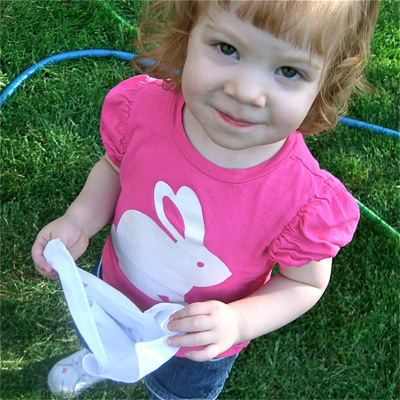 Bring the corners together and tie a big knot to create the bunny head and ears. Knot the remaining corners into two little arms and bring the knot up in the back to make a little bunny tail. Fold handkerchief into a triangle. Roll each corner to the center, then fold in half. Take corner on very top and fold out and around to create the cradle. Look, they're twins! Jellybean likes to hold the cradle by each corner and rock it while singing, "Rock a bye, rock a bye." 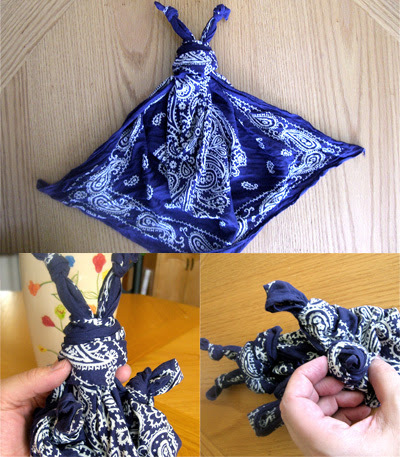 Throw a bandana or a handkerchief in your bag and experiment with some folding of your own. Here are a couple more ideas that I found out on the web. My grandma used to do the "baby in the cradle" handkerchief with me, too!!!! Thanks sparking a fond memory and for reminding me to do this with my grandchildren!! What a great idea!! I will have to give this a try. Thank you for sharing at Sharing Saturday!! I got up to the part of the arms and then got lost...what knot in the back?